Yep, just went live! Well, sort of, we found the public link to it which Google hasn’t yet provided a direct link anywhere to (Edit: They went live with it now). Be the first to own LG’s Watch Urbane! The watch, which is arguably the most premium Android Wear device to date, comes in either silver or rose gold for $349. It features a 1.3-inch P-OLED display with Gorilla Glass 3, 512MB RAM, stainless steel cover, genuine leather strap, a 1.2GHz processor, WiFi, Bluetooth 4.0, IP67 water resistance, and a 410mAh battery. It’s also the first Android Wear device to run the new Android 5.1.1 update, which will help it take advantage of that WiFi chip. If interested, and you are in Australia, Canada, France, Germany, Hong Kong, Ireland, Italy, South Korea, Spain, United Kingdom, or the United States, you should be able to buy this watch today. 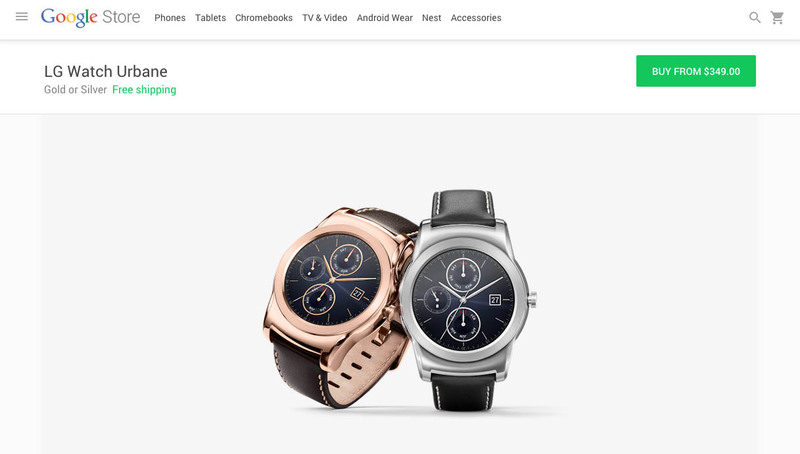 On a related note, the regular LG G Watch is now no longer available.